The Alcatel-Lucent 8262 DECT Handset is the perfect communications companion for your mobile workforce operating in demanding environments such as construction, manufacturing or the oil and gas industry. 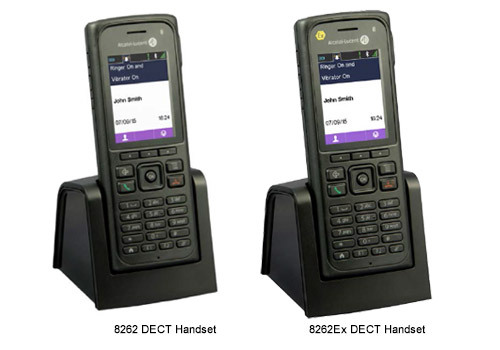 The 8262 DECT Handset provides a complete set of Isolated Worker Protection services that protect lone workers from incidents and accidents at the workplace. These include: Man-down,no movement, pull cord, and emergency button. Robustness ensures your employees stay connected to the rest of the organization. Isolated Worker Protection services provide your workforce with a consistent set of innovative features. Accurate device geo-location ensures worker protection. Compatibility with previously deployed Alcatel-Lucent DECT devices to ensure investment protection. HD audio and common ergonomics with the 8242 DECT Handset assure immediate adoption by the user.